Are you tired of food that looks pretty and occupies a quarter of your plate and is usually served with a large dose of attitude? 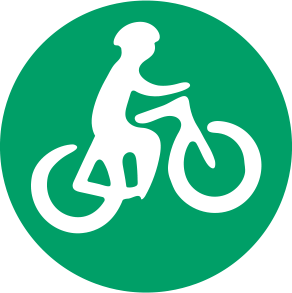 Have you had enough of traffic and queues and waiting for your turn to have fun? 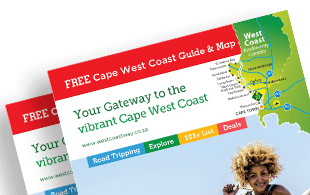 The next time you come to the Cape, turn your back on Table Mountain and discover the meaning of a relaxing holiday, slow living and real people on the West Coast Way Tractor Route. Road trip, day trip or stay for weeks, it’s time to pack away the sharp suits and the high heels, slip into your favourite jeans. Add a T-shirt, camera, bike, running shoes or whatever gear spells good times to you, and take a break with a twist. 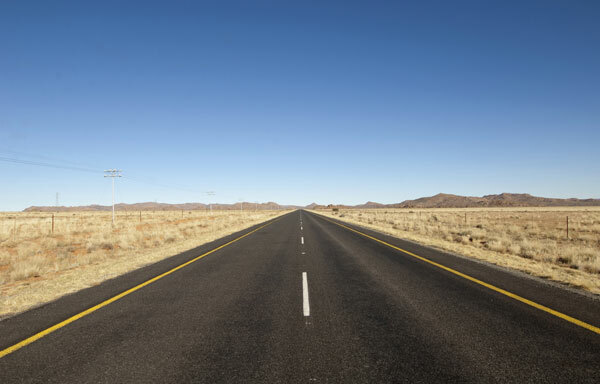 The N7 is six hundred and seventy kilometres of hot black tar heading relentlessly north from Cape Town all the way to Vioolsdrift at the border to Namibia. 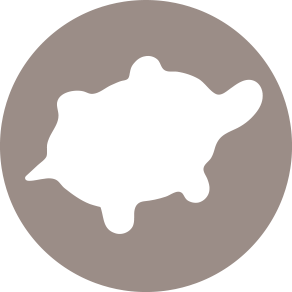 Parallel to the N7 on the coastal side, is the R27, one hundred and forty kilometres of equally straight road, starting in Cape Town and ending at Velddrift. 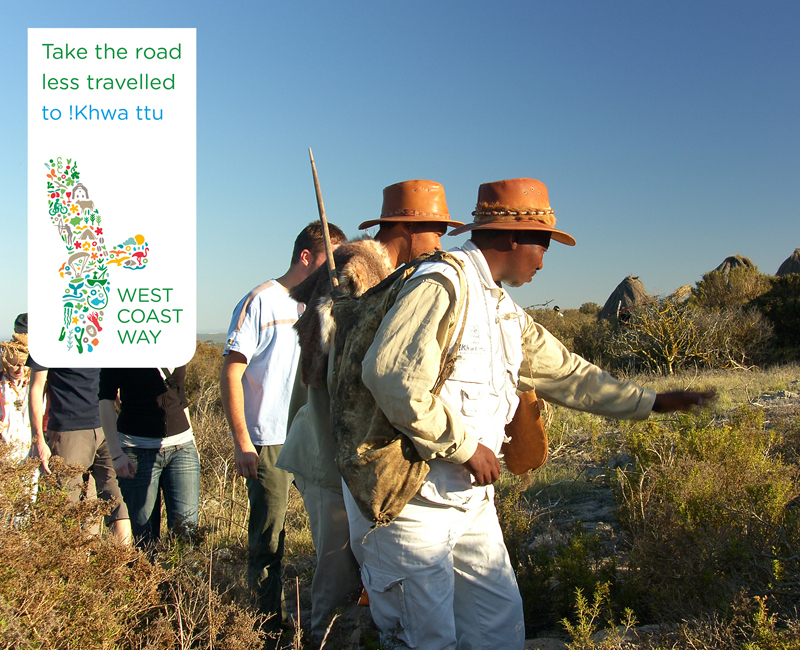 The R45 is a diagonal slash linking the N7 and the R27 and taking you into the very heart of the West Coast. These roads are long and mostly straight but contain countless opportunities to twist off left or right to explore the ocean, mountains and valleys and the tiny towns they hide. Voted one of the prettiest towns in South Africa, Riebeek Kasteel is perfect for tourists without being too touristy. It has been an epicurean destination of note for years. For a small village, it has a large number of eating and drinking hotspots. No run-of-the-mill places either; there is an element of quirkiness that runs like a thread through the town. At Garagista Microbrewery a blackboard welcomes you with this. 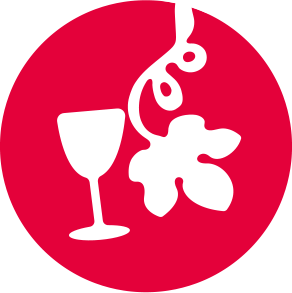 “How Merlot can you go?” is the question on the wine list at Eve’s Eatery & Bar, where a shop mannequin dangles from a bed above the doorway holding a bubbly glass out to be filled. A tame chicken sleeps on the piano and Mao Tse Tung posters on the walls at The Red Tin Roof Gastro Pub situated in a manor house that is over 100 years old. Owned and run by Jacques Pauw and Sam Rogers, both previously prominent journalists in South Africa, fascinating hosts to talk to. Burgers on vetkoek, chicken pie, and biltong pizza affirm their belief that local is lekker. 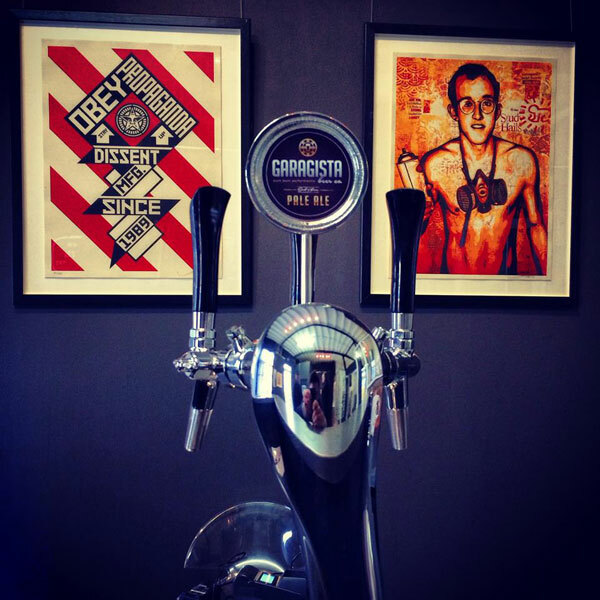 Being on holiday is thirsty work and there is no shortage of thirst quenchers in town all vying for your attention, urban hipster or not. For Gin, have yours at the Royal Hotel on the alleged longest stoep south of the Limpopo. If you hit the town on a Thursday head to The Alchemist for “Thirsty Thursdays” and start with a Bloody Mary. Wine aficionados must visit Allesverloren which dates back to 1704. Lunch at their restaurant; The Pleasant Pheasant is a good excuse for a long afternoon of wine pairing. 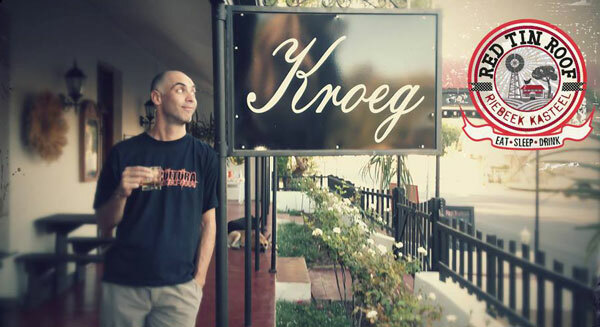 Olives and wine go well together and at Kloovenburg you can have both. Great wine paired with olive jams, salt or tapenade, and a bottle or two to take home. Add some of their olive oil beauty products too, to maintain that healthy holiday look. Shopping is part of any holiday that involves a human of the female variety and this town offers all the essentials like crocheted tyre chairs, moustache wax, bath mats and laptop bags as well as more mainstream items like handmade clothing, essential oils, artworks, and sculpture. While you are in the area of the West Coast Tractor Route consider these twists off the main roads. A twist left from the R27 to an urban conservancy, South Africa’s longest stretch of beach and an unusual challenge to stay upright and complete the hike, trail run or cycle West Coast style. 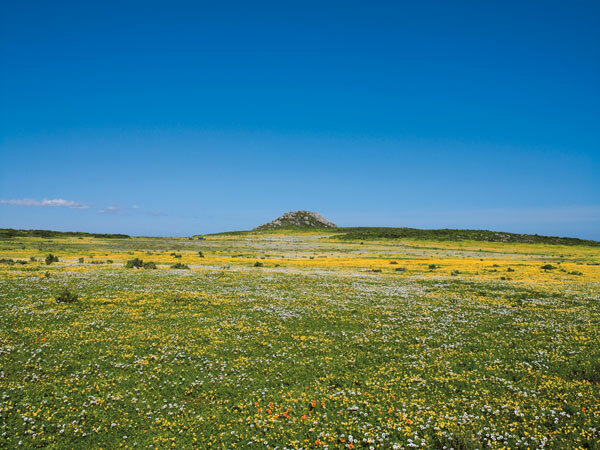 The West Coast Biosphere Trail links Yzerfontein and Darling and includes stops for wine and olive tasting, a seafood feast and a craft beer pairing. A surprise in the form of a tractor with part of its wheels visible above the sand greets walkers during the low ebb of spring tide after stormy weather on the beach at Pearl Bay. 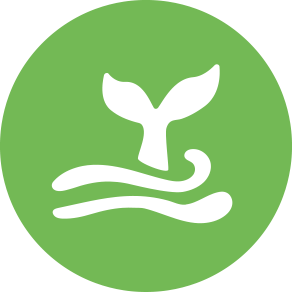 The wreck is the result of a rescue mission in 1997 when a ski boat ran into trouble between Dassen Island and Yzerfontein and washed up on the beach. Gilbert Basson came to help in his Land Rover, but soon found himself in trouble also when the Land Rover failed to rise to the challenge. He sent for his trusty Nuffield that, low and behold, also got stuck. By that time, the tide was rising fast and it was decided to give up on both the boat and the tractor. Over time, the Nuffield sunk deeper and deeper. 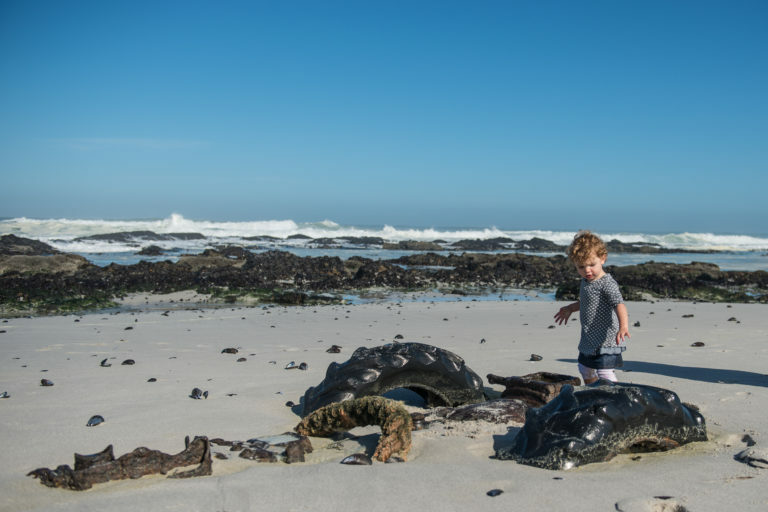 Few Yzerfontein residents know about the wreck that can disappear for more than a year owing to changing weather patterns and sea currents. You will adore eating and drinking up this little town. 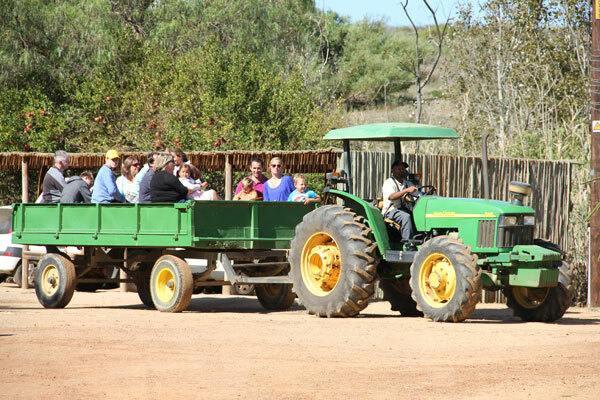 Pop in at the Darling Museum and enjoy their display of a beautifully restored spider wagon. It’s a right twist off the R27, home to Darling Brew craft beer, the Darling Wine Shop and a trail known as the Darling Stagger. 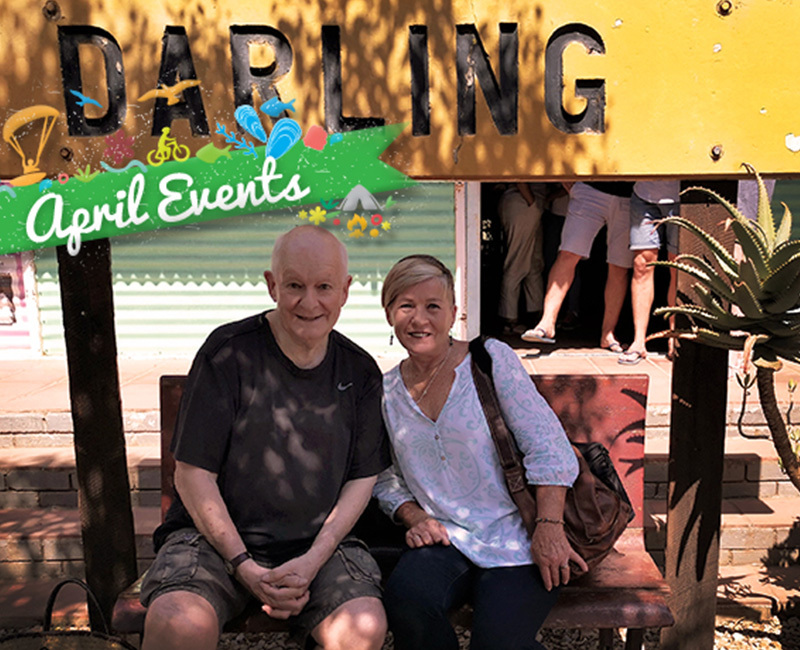 The Mystery Trail around the town or a visit to Evita se Perron, home of satirist Pieter-Dirk Uys, provides mental stimulation to counterbalance holiday brain status. 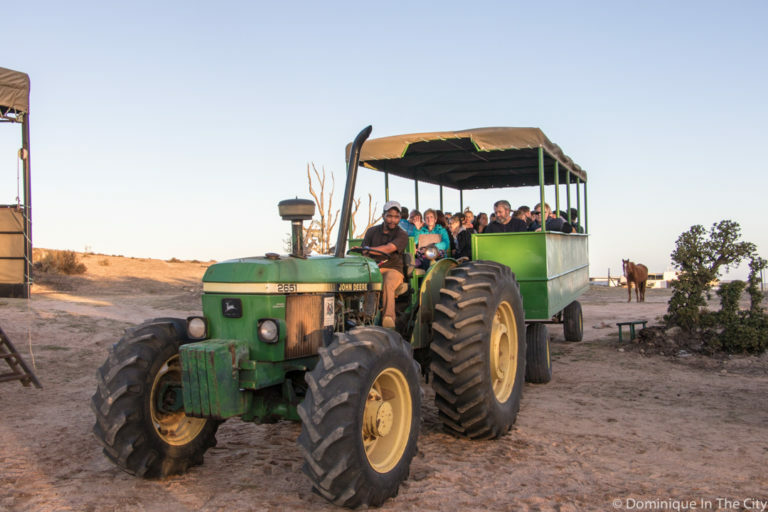 !Khwa ttu offers special tractor rides during the Spring/Summer Season with their Sundowner Evenings which happen on the first Friday of every month. Keep an eye on their Facebook page for the next one. Book your !Khwa ttu accommodation, San Guided Tour or Sundowner Evening Today! 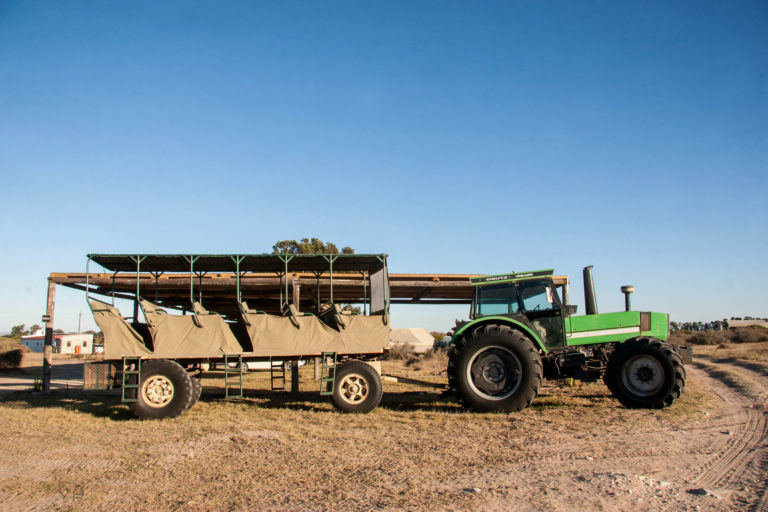 The Groote Post Country Market happens on the last Sunday of every month during the Spring/Summer season and they offer special tractor rides for the whole family. Come and explore their beautiful vineyard and see if you can spot any of their wild animals. 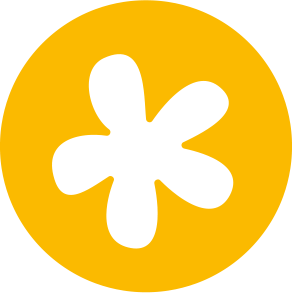 Follow their Facebook page for the next market. The dates for the 2018/2019 Groote Post Country Market are 26 August, 30 September, 28 October, 25 November, 16 December (Christmas Market), 27 January, 24 February, 31 March and 28 April. From the R27 it’s just a twist to the left and you are a Greek god or goddess at the Hellenic-themed family-friendly resort on the Langebaan lagoon. Break Instagram with your pics of champagne and sunset cruises with Elite Charters, sunrise at the private beach or your perfect swing at the Langebaan Golf Estate. Soothe away the strains of too much fun with a daily massage at the spa and remember to tag all your friends. A twist to the right from the R27 and nature owns you. The Big 5 often distract us from the other wildlife but at Thali Thali, you will fall in love with the giraffe, fallow deer, eland and other bucks. The food rivals any top city restaurant, game drives are unhurried, archery is not as easy as it looks, the pool is refreshing and the fire pit glows. Sunsets from the deck overlook a small waterhole and at night the stars provide all the light you need. 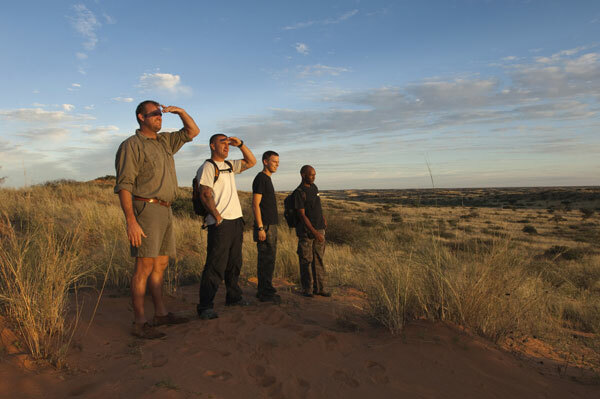 Book your nature destination getaway and game drive today! Wind farms and wheat fields dot the landscape as you twist left from the R45 to this slow town. The Dutch Reformed Church is the centerpiece of this town and fresh, seasonal food is its heart. At the Moose Farm Stall, foodies will be torn between photographing, buying or eating the free range eggs, freshly ground flour and hand grown herbs and veggies on offer. Organic honey and beauty products are available at Simply Bee. This is iconic West Coast, complete with wind pumps, blue skies, yellow fields of wheat ringed by imposing mountains shimmering in the distance. It’s a tiny twist left from the N7. 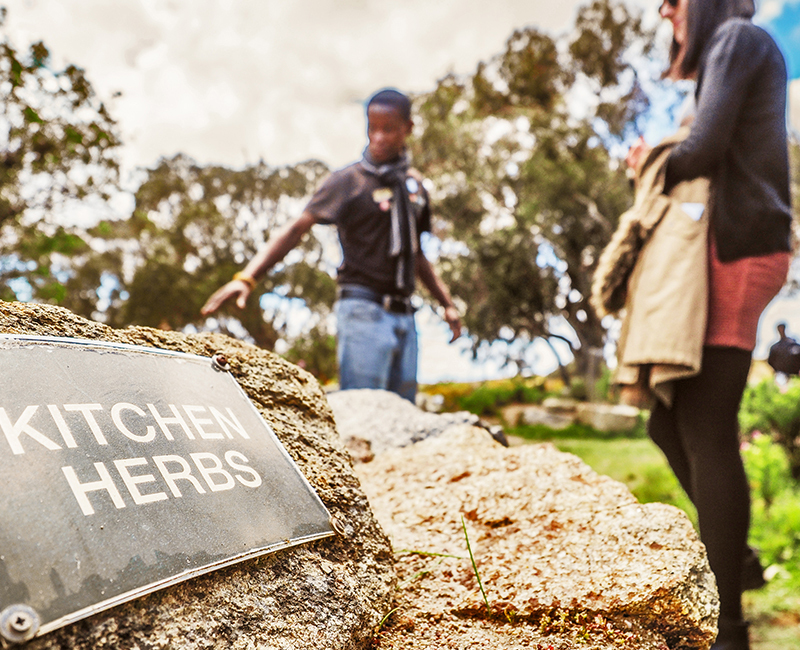 Fuel up at the Desert Rose Farm Stall then if you dare, go mountain biking to a secret destination in the Swartberg Mountains or go and find the Autshomoa fountain. Guaranteed to give all your Facebook friends serious FOMO. This is no place for the wheat intolerant as it’s the heart of the wheat industry and is where you will find one of the three wheat museums in the world. If you have never walked a labyrinth, there is an eleven-circuit one in the local park. Walk it, even the sceptical find the results quite surprising. 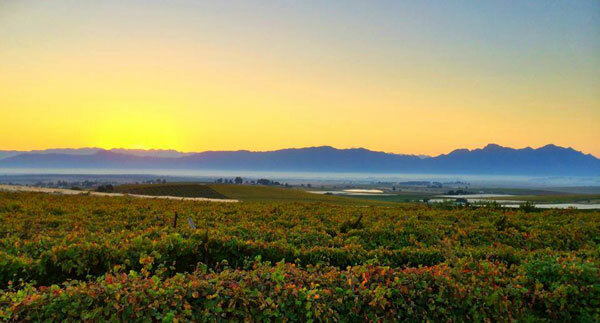 Twisting right from the N7 are the towns of Riebeek Kasteel and Riebeek West, surrounded by vineyards, olive groves and the occasional blockhouse as a reminder of the Boer War. These towns are reminiscent of Clarens or Dullstroom with plenty of markets, festivals, shops, and eateries. Karoo-style building makes for great pics if you are a fan of #Architecture. 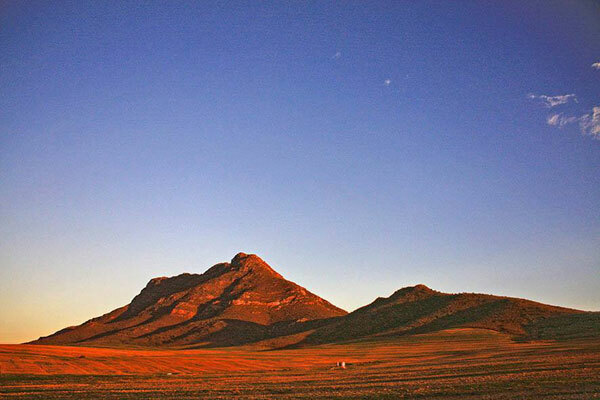 Twist to the right from the N7 and into the heart of the Swartland. This might be farming country but the people are certainly not like sheep. A few years ago the local wine farmers started the “Swartland Revolution” to promote local wines. They made their point and now you can find them collectively as SIP, the Swartland Independent Producers. 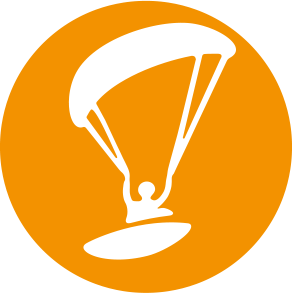 Malmesbury is a large town with all the usual amenities, wine tasting galore, and for the adventurous, a leap of faith with Mother City Skydiving. The Basson family takes great pride in welcoming you to Darling Olives, a family-run business located on Alexanderfontein Estate just 3km outside of Darling. Their location offers the perfect balance of cool, refreshing air from the Atlantic and hot, dry summers – resulting in delicious olives that you simply have to experience. The pretty, little historical town is a perfect weekend breakaway. Dominating the town is the large NG church, but just below this are a series of little streets with a couple of shops and the Pepper Tree Art Stable and Coffee Shop that serves as a natural hub for both locals and visitors to the town. The white sand beaches surrounding the clear waters of the Langebaan Lagoon are very popular, and the mild climate and protected waters of the lagoon make it the perfect location for many water sports, including sailing, kayaking, kitesurfing, and fishing. 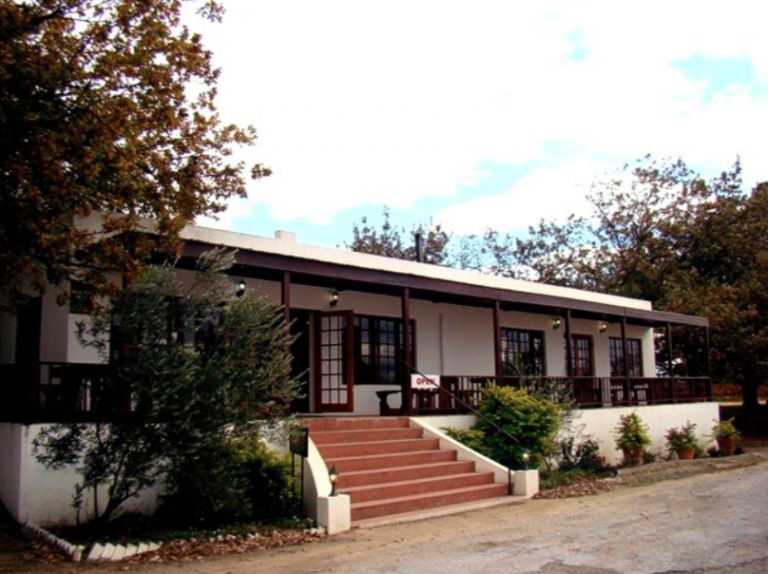 This wonderful tongue-in-the-cheek eatery, farmstall, nursery, petting zoo, and pub, promotes a healthy, organic lifestyle and are passionate about recycling, upcycling and caring for the environment as well as the local community. 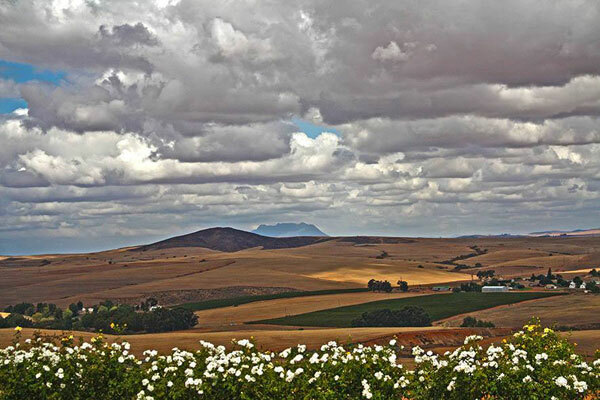 Bartholomeus Klip is an exclusive destination in the Riebeek Valley, just 25 minute drive from Riebeek Kasteel, in the Cape Winelands, located on a working sheep and wheat farm at the Elandsberg Nature Reserve. Discerning travellers will appreciate the peace and quiet in the exclusive five-bedroomed farmhouse, while families with children can enjoy privacy in the Wild Olive House & Cottage.